VeeMax, Software Exciter/Enhancer from g200kg. 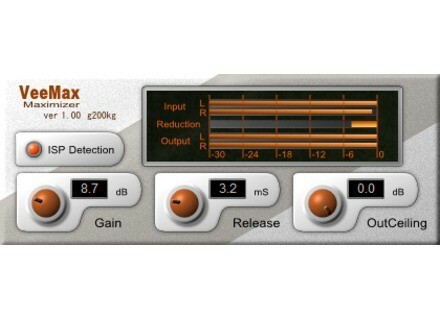 g200kg has updated the Maximizer plug-in, VeeMax, to version 1.10. 'Stereo Link' switch is added. New GUI response (including the mouse wheel support). Cinesamples CineBrass Cinesamples has announced the release of CineBrass, an orchestral brass sample library for Kontakt. ifoundasound LiveProfessor Beta 2.0 ifoundasound has announced the release of LiveProfessor Beta 2.0, which brings various changes, most of them are under the hood. DNR Collaborative DEFCON3 DNR Collaborative has released a beta of DEFCON3, a multiband audio deconstruction effect for Native Instruments Reaktor.